Check out the radio show on The Trail 103.3FM and Fresh 104.5. The live stream feed is online at www.trail1033.com where you can click on “Listen Live”. The WineGuyMike™ Radio Show© on both radio stations on Sunday mornings at 10:00AM MST. This week on the WineGuyMike™ show I’m very pleased to introduce you to a great winemaker. Just like his Wine By Joe, Really Good Wine without attitude, this personifies Joe as well. A really great winemaker without attitude, he just has a burning passion to produce great wines to share with you and me. Joe does this and his Wine By Joe over delivers, just what WineGuyMike™ loves to share my readers and radio show audience listeners. Let me introduce you to my new wine friend Joe Dobbes, Proprietor and Winemaker. Joe Dobbes is a true Oregonian. He was raised in a small town in the north Willamette Valley where he began his career in agriculture. Joe grew, picked, sold, and delivered(by bicycle with his dog) Marion berries to the well known Smuckers corporation. This set the stage for Joe’s entrepreneurial and winemaking endeavors. Joe went to college in Ashland where he earned his degree in business. Following college Joe ventured overseas and started training in the wine business in 1985 in Germany at Weingut Erbhof Tesch, located in the Nahe region of Germany. Joe briefly returned from Germany to work with the well known Elk Cove winery in Oregon. Joe’s continued desire to become a master at his craft of winemaking once again took him back to Europe to the hallowed grounds of Burgundy, France. In 1988 Joe found himself working at the esteemed wine estates of Domaine G. Roumier and Domaine Comtes Lafon in Burgundy with winemasters Christophe Roumier and Dominque Lafon. Upon his return from France he landed his first head winemaking job at Eola Hills Wine Cellars in 1989, followed by winemaking positions at Hinman Vineyards where his entrepreneurial spirit blossomed when he revamped select Hinman Vineyard’s wines into the new Silvan Ridge Reserve label (1991 – 1995). 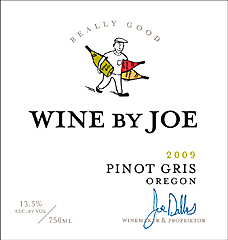 Joe then became Willamette Valley Vineyard’s winemaker and vice president of production, and simultaneously winemaker for the Griffin Creek and Tualatin Estate labels (1996 – 2002). After 17 years of working for others Joe decided it was time to strike out on his own and founded Dobbes Family Estate in 2002 and Wine by Joe in 2003 and has never looked back. Joe also has his own custom crushing company and consults for as many as twenty wineries. His real success though is his wonderful family, wife Patricia Dobbes and two teenage children, Amelia (AKA Skipper) and Griffin, all of whom have wines named after them. Joe’s expertise lies in producing wines of impeccable balance that are true to their varietal character, specializing in Pinot Noir, Pinot Gris, Pinot Blanc, Viognier, Syrah and now added a Gewurztraminer, Rose, and Chardonnay into the mix. I personally can’t wait to taste Joe’s winemaking touch with these new varietals. The Dobbes Family Estate line of elegant yet powerful wines from Oregon’s premier vineyards carries the crest of Joe’s extensive winemaking experience. Willamette Valley Pinot Noir and Pinot Gris; and Rogue Valley Syrah and Viogner are some of the best in Oregon under the Dobbes Family Estate label. The specialty estate wines are all limited release and available online(where permissible) and at the tasting room. Wine By Joe, the family of three Pinots, hit your tables in August 2004. This fun package of serious wine begs to be poured on your everyday table with lots of great company. 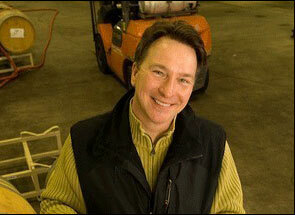 In February of 2006, Wine By Joe, LLC became one of the largest vineyard holders in the state of Oregon. Joe’s 214-acre estate vineyard is located in the Eola Hills/Amity AVA (American Viticulture Area), in the Willamette Valley’s Polk County, approximately 10 miles west of Salem. The vineyard site has a cool coastal influence due to the late afternoon, summertime breezes blowing through the Van Duzer Corridor from the Pacific Ocean approximately 45 miles to the west. The cool breezes during the height of the warm summer affects ripening by allowing for longer hang time in the vineyard for full maturity of flavors, fruitiness and overall complexity. The vineyard encompasses eastern facing elevations from 203 to 328 feet and western facing elevations from 208 to 320 feet. The vineyard was planted with Pommard and Wadenwille clones of Pinot noir in 1988. Pinot Blanc, Pinot Gris and additional Pinot Noir were planted in 1989. The most recent planting took place in 2004 and 2005 to bring the total planted acres to 189; comprised of 80 acres of Pinot Noir, 82 acres of Pinot Gris and 27 acres of Pinot Blanc. A special note to all of the WineGuyMike™ readers and listeners a portion of Wine By Joe proceeds are donated to the American Foundation for Suicide Prevention Northwest. Joe gives back and we love this here at WineGuyMike™. I want to thank my special guest Joe Dobbes for taking time out of his busy schedule to be a guest on the WineGuyMike™radio show this week and to share his story. Joe we love your story and all that you do, thanks for sharing it with all of us. 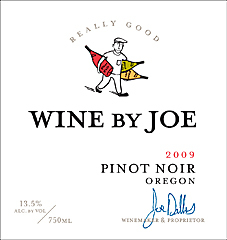 Wine By Joe receives the WineGuyMike™ Seal of Approval®, I recommend all of the wines from Wine By Joe. All of the Wine By Joe are great companions for the dinner table too. Joe Dobbes is an outstanding winemaker whose wines you must try. The wines that Joe makes are a result of what he brings to the table from his Old World winemaking style and experience in Europe. This is where Joe’s past intersects with a corner of what I consider to be some of the finest terrior in the New World today, the Oregon wine country. The result is Wine by Joe. You will experience sweet aromas of fresh cut pears, green apples and hints of vanilla and cream, this Pinot Gris will not disappoint you. The light clean flavors in the mouth encompass citrus and green apple well-balanced by refreshing and flinty acidity for a perfect and lively finish with lingering hints of citrus rind. You will be delighted with this classic Oregon Pinot Gris!